Is Rose Essential Oil Worth the High Price Tag? If you’ve ever browsed essential oil catalogs and almost keeled over when you saw the price of rose essential oil, you’re not alone. Real rose essential oil (NOT rose geranium or other wanna-be roses) can cost as much as a couple hundred dollars for a tablespoon of oil, depending on the manufacturer. Even if you happen to have a great wholesale source, you’re still looking at close to $100 for that 15 milliliters (ml). Sure, you’ll come across a site that advertises rose essential oil for $20 a bottle. Then you get there and realize that the “bottle” is really 3 ml. To put that into perspective, one teaspoon is just under 5 ml. With a price tag that high, why on earth would you want to buy rose oil when there are SO many other amazing essential oils at a much lower price point? That’s what we’re going to talk about! Why is rose essential oil so expensive? FYI, this post contains affiliate links. If you make a purchase through these links, I earn a small commission at no extra charge to you. This post was updated in 2018 with additional information. First, it’s helpful to know WHY rose oil is so freaking expensive. It’s not just an arbitrary price. Some greedy mogul didn’t say “chicks like roses, so lets make the cost of the oil astronomical.” The price is insane because the process to make that tablespoon is insane. 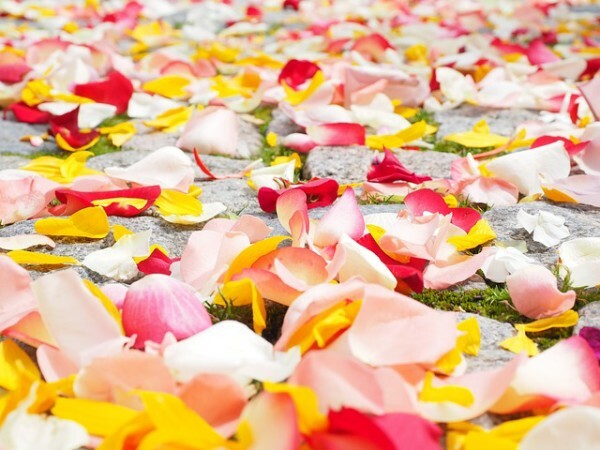 It takes about 60,000 roses to make one ounce of rose oil. That’s a lot of roses, which are already an expensive flower! The number of roses it takes to produce rose essential oil isn’t the only insane part of the process. Flowers are harvested by hand, typically on the morning of the day they’ll be processed. Then they have to go through an intense distillation or solvent extraction process. Basically, it’s really expensive to make rose oil and that cost is passed on to you. The process is a lot more complicated, but I’m not a chemist so I don’t feel confident that I could explain it without giving you the wrong idea. Is Rose Oil worth the cost? What is Rose Oil good for? Here’s where we decide if it’s really worth it. I’ve been using essential oils for a myriad of purposes since I was a teenager. My mom also spent a few years as a soap maker, so we had a closet filled with essential oils. In all those years, I’ve never purchased rose essential oil. My mom did once, I believe. In a very small amount. She used it for a fabulous face cream. Which brings me to my first point. Rose essential oil is great for aging skin. Mixed into a moisturizer or with a carrier oil for a massage treatment, rose oil really is fabulous for your skin. Some say it’s even great for those with eczema, although I strongly recommend checking with your dermatologist first. If you want to try out rose oil for its skin benefits, you’re better off just buying a good cream that already includes it. If you find that it works well for you, then you can invest in a small bottle of rose oil and start making your own. Some people will even tell you that rose oil can help fade scars and stretch marks. However, if this is the only “selling point” for you, there are other cheaper oils that work just as well. Calendula , for example, is pretty renowned for this purpose. It comes from marigolds, a relatively inexpensive flower. I’m actually growing a bunch of marigolds this year (well, my mom is, I am a horrific gardener), so I may try extracting my own oil from them. I’m not holding my breath that I’ll succeed though! Still, it could be a fun project! It’s great for people with anxiety. While I’ve never bought rose oil, I’ve smelled it before. I’ve also used products that contained it. Rose oil has a good rep for being very relaxing for people suffering from anxiety and PTSD, two things that I know way too much about. For those purposes, I would recommend using them either in a diffuser or in a massage oil. You can also add ONE DROP (this stuff is expensive, remember?) to a cotton ball, hold it in your hand, then cup your hand over your nose to inhale. Again, there are other essential oils that achieve the same (or nearly the same) anxiety-busting effects as rose oil. Lavender oil is insanely cheap and is one of the most relaxing EOs out there. I am one of the few people who doesn’t love the smell of it on its own. I need it mixed with something like vanilla to find it appealing. You can also find the same benefit from essential oils that evoke happy memories. Scent is a powerful thing! Cinnamon , for example, reminds me of my grandmother and helps lift my spirits. It can help get your mojo back, baby! Just like the flowers from which it comes is considered one of the most romantic flowers of all time, rose essential oil MAY act as a aphrodisiac for some people. Again, go with a diffuser or massage oils. I like massage oils because you can add a couple small drops of the essential oil to a great carrier (jojoba , avocado oil, etc) and stretch it a lot further. It should go without saying (but I’ll say it anyway): you should never ingest essential oils. They’re for external use only. You should also consult with your doctor before using EOs if you have any preexisting medical conditions. Also, some sites will tell you that rose oil can be applied “neat,” meaning without adding to a carrier oil. For some people, this may be true. In my opinion, only lavender and tea tree oil are safe enough to apply neat, and even those are iffy. Use a carrier oil unless you know how your skin will react. Now that we got all that out of the way, back to the topic. So we’ve talked about the potential benefits of rose oil (and I say “potential” because everyone reacts differently). Now, let’s decide, are those benefits worth the high price tag? Do the benefits of rose oil outweigh the price tag? The answer really depends on you. Honestly, as I mentioned in each section, there are other essential oils that will do all of the above. Lavender is dirt cheap and also helps with insomnia, anxiety and skin problems. Orange oil always makes me happy when I smell it. Ylang-ylang rocks for PMS. Rose oil is amazing, but unless you have the budget for it, it’s not the only oil that can do what it does. Does it do it the best? Some will say yes, absolutely. But sometimes “the best” is only a little better than the second best, so keep that in mind when making your decision. One word of warning: I saw “rose oil” on some sites for like $20 for 10ml. I can say with at least 90% certainty that this is NOT the real thing. I’m not one to accuse someone of fraud without all the facts, but it is HIGHLY unlikely that it’s real. Keep that in mind. 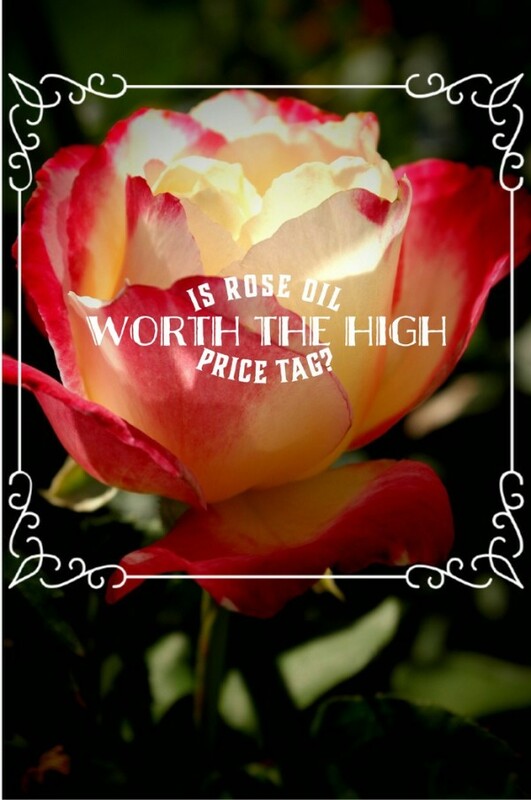 If you see rose oil at a price that seems too good to be true, that’s because it IS too good to be true. Bottom line: it’s worth the price if you have a lot of wiggle room in your budget and want the best of the best, or if you absolutely LOVE the scent. Otherwise, you can probably find another oil that works just as well. I’ll be talking more about essential oils in the future. As I said, I’ve been using them forever, and now that they’re “in,” I figure it’s time to write more about them. So keep an eye out for those, because I’ll give you the straight facts on what’s worth it and what isn’t! I’m also not going to feed you a line about miraculous benefits that you just might not see (again, everyone reacts differently to natural medicine, just like everyone reacts differently to man-made medications!). Call it the “essential information about essential oils” series, if you want! What do you think? Have you ever used rose essential oil? Do you think it’s worth the high price tag? I’m still new to essential oils but I do own a rose facial wash and a rose day cream and thinking about it, I’ve had no flair ups of psorasis or beakouts!